Since their development in the laboratory over five decades ago, lasers have found increasing use in our everyday lives. In the field of medicine, it’s not uncommon to find lasers in the offices of dermatologists, ophthalmologists and surgeons, to name just a few. Now, some dentists are finding that lasers can offer an alternative means of treating gum disease — and one that may have advantages in certain situations. You probably know that a laser produces a special kind of light — in fact, its name is an acronym for “Light Amplification by Stimulated Emission of Radiation.” Essentially, a medical laser uses electrical energy to produce an intense and narrow beam of concentrated light. This light can be directed to a particular area, often via a fiber-optic channel. The laser’s precision allows a doctor or technician to focus the light energy exactly where it’s needed — to remove diseased tissue, seal off blood vessels, and sterilize a wound, for example. For several years, periodontists — dentists who specialize in treating diseases of the gums — have been researching the use of lasers for treating certain types of gum disease. In standard clinical practice, hand-held instruments and ultrasonic cleaning tools are used at regular time intervals (3 – 6 months) to remove the sticky bacterial biofilm, as well as calculus (tartar), that forms in between teeth and gums. If that still isn't effective, gum surgery may be required to access the affected area, remove diseased tissue, and reduce pocket depth (the space below the gum line that gets larger as bone loss occurs) to prevent reinfection. Recently, however, several new procedures have been developed that use lasers to accomplish some or all of these goals. One type of therapy uses a special laser that emits pulses of light with a specific wavelength (color) of 1064 nanometers. This light passes through healthy cells like a sunbeam through a window — but when it encounters darkly-pigmented bacteria, it vaporizes them instantly! One of the potential advantages of laser treatment is its precision: focused directly on the area where trouble occurs, it targets diseased tissue but leaves healthy tissue alone. Another is that laser treatment is less invasive: It requires less tissue removal, and may cause less discomfort and tissue shrinkage (gum recession) than conventional periodontal surgery. And because it produces small amounts of heat, it can seal blood vessels and help control bleeding. While lasers have long shown promise for treating gum disease, until recently it wasn’t clear if they offered any advantages over traditional methods. Now, several studies have shown that certain laser treatments can be just as effective as traditional gum surgery in many cases — with the potential benefit of being less invasive. 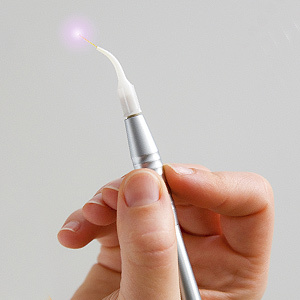 In the future, the use of lasers for periodontal procedures is likely to increase. It’s important to remember that no single treatment — not even a laser — can “zap” gum disease in one fell swoop. Controlling periodontal disease requires effective at-home oral hygiene combined with regular professional care. If you have questions about periodontal disease, please call our office to schedule a consultation.